This week, both Finnish and foreign companies within sauna, wellbeing and travelling industries assemble in Jyväskylä to discuss the marketing potential of the Finnish sauna from an international point of view. World Sauna Forum is an event arranged by Sauna from Finland, a network including almost 200 companies. The core of the event is in how to turn the sauna experience into a product for tourists here in Finland and in other countries of the world. – One should think the sauna experience as a entirety that consists of what happens before, during and after the sauna. The companies in our network have expertise in all aspects of the experience from cosmetics, textiles and drinks to companies of building, lighting and productizing the sauna, and not least – sauna traveling. In World Sauna Forum all of these companies are brought together, and as a cherry on top there will be international companies and media present, tells Carita Harju, the Executive Director of Sauna from Finland. – The meaning of the event is to bring operators, especially Finnish and international companies, together to promote the patch of the Finnish sauna experience outside of Finland. One must remember that we are talking about an asset that boosts both the image and economy of Finland, because the Finnish sauna stands out with its researched health benefits, variety and most of all with reputation that puts emphasis on relaxing. The program includes interesting talks and a panel discussion about the Finnish sauna experience on the international market. The list of speakers is indeed impressive: Johnny Wärnelöv, CEO of TylöHelo, Terhi Pesonen, Head of R&D at Lumene, Ilkka Länkinen, an adventure travel entrepreneur, and Leena Turunen, Area General Manager at Lapland Hotels. In addition, there will be a speech held by Jake Newport, the director of Finnmarksauna, a company which promotes and sells the Finnish sauna in Great Britain. Newport’s talk will include i.a. reflection on how the Finnish sauna experience could be concepted to the Brits, who have understood the functions and meaning of the sauna wrong to begin with. – Many Brits are falsely informed that the sauna doesn’t need any air conditioning, that the stove doesn’t need any stones and that you’re not supposed to throw water on them. With my talk I want to awake discussion on how to standardize the authentic Finnish sauna abroad to make sure that when we talk about the Finnish sauna, it’s really the original version, Jake Newport comments. 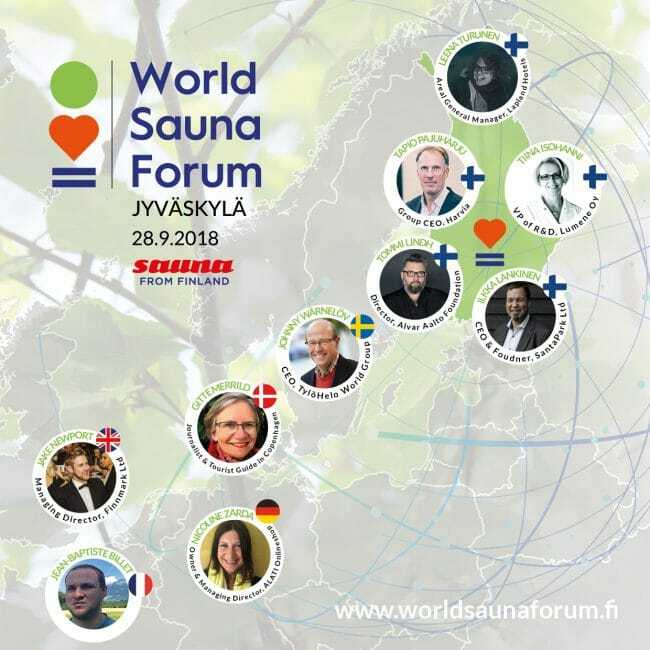 World Sauna Forum takes place on Friday September 28th in the Aalto hall. This year’s theme, design, wellbeing and business, is in fact to honour the 120th jubilee year of Alvar Aalto. Additionally, in honour of this, there will be a talk by the Director of the Alvar Aalto foundation, Tommi Lindh. A variation of perspectives about the Finnish sauna in the international market will be presented in the panel discussion as well. The participants in the discussion are Tapio Pajuharju, CEO of Harvia, Nicoline Zarda, the owner of the German sauna online shop ALATI, Jean-Baptiste Billet, a French sauna expert, Gitte Merrild, a Danish journalist and a guide, Sho Yoshinaga, CEO of the Japanise Metos concern, and Emi Sato, the chief of the newly opened Sauna Soppi. – The market potential of the Finnish sauna is massive. World Sauna Forum is the most interesting and versatile event around the Finnish sauna experience, says Carita Harju.